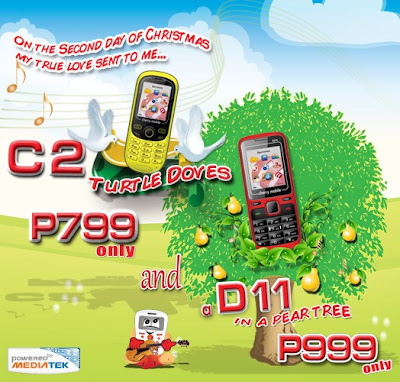 As a treat for their fans this Christmas, Cherry Mobile offers two dual-SIM phones the C2 and D11 ,a very affordable handset loaded with basic features.C2 will cost PhP 799 and Php 999 for D11 respectively. The Cherry Mobile C2 is a music phone with colored LCD has an MP3 player, FM Radio and Loud Speaker entertainment with built-in games It has also a flashlight and expandable MicroSD up to 2GB. Another treat is the Cherry Mobile D11 for PhP 999 with features such as Camera, FM Radio, Multimedia Player, Loud Speaker and Flashlight. Also has a built-in games and support up to 8GB MicroSD. Both phones are available in different colors. Available at all Cherry Mobile outlets nationwide.